Now let's look at the toss, body turn and leg action. Let's keep going now and see what the high speed footage shows us about some of the other key aspects in his motion. In this second article, we'll take a look at Roger's tossing motion, how he positions the ball at contact, and his speed/spin combinations. Then we'll look at his torso rotation, his leg action and his followthrough. Again, the high speed video shows that on these elements Federer is a beautiful technical model for most severs. One of the components that gives any serve its particular look and feel is the shape and timing of the tossing motion. Roger's toss is actually beautiful to watch. It's minimalistic and fluid. It creates a rhythm that carries over into the rest of his serve. Federer's toss: minimal and rhythmic. We saw that at the start of the motion, Federer's racket tip is pointing basically straight ahead in the deuce court, and a little to his right in the ad. His tossing arm is straight with the ball aligned with the throat of the racket. This position makes the start of the motion simple. His arms drop downward together. The tossing arm falls to the inside of his front leg and is still straight when it reaches the bottom Then the tossing arm moves immediately upward, deliberately but without being rushed. At the start of the upward motion the tossing arm is still straight, and it stays that way all the way to the top. The release of the ball is a little above shoulder level. The arm then continues upward until it reaches full extension, pointing more or less directly upward at the sky. There is no discreet moment when Federer "throws" or "tosses" the ball. Federer's tossing arm lifts the ball as he opens his hand. Take a close look at his hand and see how he holds the ball. Some players hold the ball on the fingertips and this is commonly taught. But Federer cups the ball partially in the palm of his hand. At the release, he simply opens his hand and the rising motion of the arm lifts the toss upward into the air. This is similar to Sampras, who holds the ball even more deeply in his palm. One of the most misunderstood aspects of the toss is the angle of the tossing arm on its way up. I was always taught that the arm should move straight down and then straight up, pointing forward at a right angle to the net on the way up. I taught that way myself for a long while, until I started filming the motions of top players. That's when I figured out that's not the way the toss really happens. His arm drops to the inside of his leg, then comes up pointing sideways. To my amazement, when I started looking closely at the tossing motions of the top players, I saw that on the way up the tossing arm did not point straight forward at the net. Instead the tossing arm pointed more towards the sideline. That's turned out to be true of virtually every good server, including Roger. At the time of the release, his arm is approaching parallel to the baseline, at an angle of maybe 15 or 20 degrees. The purpose of the "straight down, straight up" tossing motion, I was taught, was to release the ball so that it could travel directly upward in front of the server. But video shows that this isn't how the ball actually travels. Rather than traveling straight upward, the toss traveled on a curve. The actual path is on an arc moving from the players's right to his left. Watch the movement of the toss from the player's right to left. This curved path is related to the position of the tossing arm. At the time of the ball release, the tossing arm points sideways. If the ball traveled straight upward it would end up so far to the right that the player couldn't possibly create the correct contact point. Since the player releases the ball with his arm extended to his right, the ball has to travel on a curve back toward the player to reach the contact point. The width of this arc for Federer is about 2 feet. This is similar to all the other top players. So the contact point is actually an intersection of two objects moving in different directions. The racket head moving upward and somewhat to the players right, and the toss, moving to the players left but also downward. If we look at the arc of the toss we can see that it not only travels from right to left, it also drops significantly before contact. Here is another common belief that is still widely taught. "Hit the ball at the top of the toss." In Federer's case the toss drops about 3 feet before contact. This is a little more than Sampras and substantially less than Roddick. From the top of the toss, the ball drops 3 feet or so to contact. All the top players hit the ball somewhere on the way down. No one in the modern game hits the ball at the top of the toss, and very few ever have. (Click Here to read more about this). Roscoe Tanner is commonly pointed to as an example of a top player who hit the ball at the top. He may be the only one, unless you want to count Kevin Curren, the South African who was in the top ten in 1980's. Goran Ivanisevic is sometimes cited as a modern example of a player who hit the ball at the top, but that's not actually true. As quick as his motion was, he still hit the ball several inches on the way down. (Check it out for yourself in the Stroke Archive. Click Here.) Among current top players, Roddick has one of the lower tosses, but it still drops well over a foot before the contact. Why do top players toss above the contact point? It has to do with timing and rhythm. The height of the toss determines the interval the player has to hit the serve. The higher the toss, the more total time. A super low toss doesn't give most players enough time to move through the technical positions of the motion, particularly if they have significant body rotation or use the legs much in their motion. Players with slower natural rhythms and longer backswings will also tend to add time by raising the tossing height. For all the elements to work together and produce the most possible racket head speed, the motion needs to be smooth and relaxed. Every player has his own rhythm and should find the toss height that helps create that rhythm. The motion shouldn't feel rushed. It shouldn't feel like it lags at any point either. The actual rhythm can vary tremendously from player to player--from Andy Roddick to Nicolas Kiefer and everything in between. Roddick and Kiefer: the range of toss heights in pro tennis. But doesn't a player like Kiefer with that stratospheric toss lose racket head speed by waiting for the ball? Well, I've seen him play a few times in person and he can crease 130mph on the radar gun, so I doubt it. He doesn't really pause or wait at any point in his motion. If you look at his serve, he has a very slow, deliberate windup, but he makes it to the pro racket drop position with the rest of his body in perfect position. From here his racket acceleration to the ball appears to be very similar to other top players. The 3 Dimensional studies that I have seen to date appears to show that the racket head speed is actually fairly constant over the path of the windup. Most of the acceleration occurs in the few fractions of a second from the racket drop to the contact. This is why a higher toss and a longer, slower backswing doesn't necessarily reduce racket head speed. When commentators say that players with higher tosses will struggle more in the wind, it seems they have a more valid point. But I recently saw Kiefer serve very effectively during hurricane-like conditions in Las Vegas. Let's just note again that virtually every great server in the history of the game hits the ball on the way down, and some, like Ivan Lendl, Boris Becker, and Steffi Graff have had ultra high tosses. If there really was some huge advantage to the low toss, it would be a commonality among top players. But it's the opposite. All the top players have high tosses, not low tosses. How far the ball curves back toward the server is a key to the contact point. Where does Roger fit in? Federer's contact point on the left to right axis, appears to be slightly further to the right than Sampras, although it is difficult to tell even in the high speed footage. The differences are relatively small and the appearance can vary with the camera angle. For example, I think I can see a light difference in the angle of the shaft of the racket between Sampras and Federer in the stills below, but if so it's a matter of a few degrees. Federer's contact point is probably directly above his shoulder or possibly a little to the left of that. Note that at contact the ball is still inside or to the left of his hand. This the same for Pete. So this means there is still a topspin component. You can see this also by looking at the angle of the shaft of the racket, titled slightly to his left. This indicates that the racket is still rising at contact. The differences in this angle indicate the (relatively) small differences in the amount of topspin the player can add to the total ball rotation. If you look at many lower level players at contact, the tip of the racket is pointing directly upward. This is typical if the toss is further to the right. From this position it is impossible to generate topspin and the player can only hit sidespin. You actually see this quite commonly in women's tennis. The toss and the contact point are more to the right with the tip of the racket straight up and down, or close to straight up and down at contact. Compare Lindsay Davenport and Elena Dementieva to the two men's players on this point. Pete's racket moves more forward toward the net. Roger's moves slightly more to the side. Another clue to the ball position and the relationship between the contact point and the amount of topspin is the path of the racket right after the contact. Again if we compare Pete and Roger, the differences are easier to see in the few frames after contact. Look at the angle of both players' arms relatively to the baseline. Sampras's arm is pointing more forward, and and less to the side or his right. Federer's arm points a little less forward more and a little more to the side. 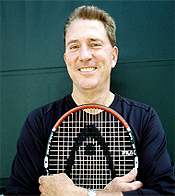 As we saw in our heavy ball articles (Click Here), the racket face travels on a diagonal across the face of the ball. What the video appears to show is that Pete's racket is traveling somewhat more forward an upward. Roger's is traveling slightly more across the ball. This is consistent with our theory of the ball placement on the toss and aslo with our spin data on both players, as we will see below. What the video also indicates is that the differences in the amounts and types of spin are the result of relatively small adjustments in the racket path and ball position. These are difficult to see with the video, let alone the naked eye. But they can make a big difference in the quality of the serve in terms of speed and weight. A lot has been made of Sampras's tendency to bend the elbow soon after contact, so that the hand and racket drop at an angle to the upper arm. If we look at the difference in the path of the racket through the contact, this makes sense. Because the swing is more directly forward, and because he is so relaxed, the racket just naturally falls forward. It's not something Pete is doing, it's something that is happening as a natural consequence of the swing. Roger averages 2000rpm on his first serve. Our study of spin rates shows that Roger is generating around 2000rpm of spin on his first serve. This compares to about 2500rpm for both Sampras and Andy Roddick. So that's about 20% less total spin. If we look at the topspin component in Roger's ball, it also appears to be slightly less than Pete. Remember we saw in our heavy ball analysis that topspin is the minority component in all serves. There is no such thing as a pure topspin serve. It's a matter of the relative amount of topspin. Pete's topspin component was around 35%. For Federer and Roddick it's more like 25%. This is why slight differences in the angle and path of the racket at contact can make a big difference in the "heaviness" of the ball. Pete has more topspin, his angle is a little steeper, the racket moves a little more forward. But the angle in Federer's racket shows that he is still hitting up at contact. The beauty of it is that Federer's ball position (or something close to it) and his motion through the contact (or something close to it) are within the reach of most players. It's not that your total spin values will equal Roger's, it's that with a similar ball position you will be able to generate a significant topspin component on your own serve.